For anyone who’s ever been there, the word Sundance likely evokes memories of celebrities, concerts, parties, screenings, business deals, fur (both faux and real) and a general lack of sleep. It’s non-stop action from the moment you arrive into town until the moment you leave. As a designer who is committed to sustainable eco-friendly design, the opportunity to bring these values to the very people who define our society’s tastes and trends is an unparalleled one. 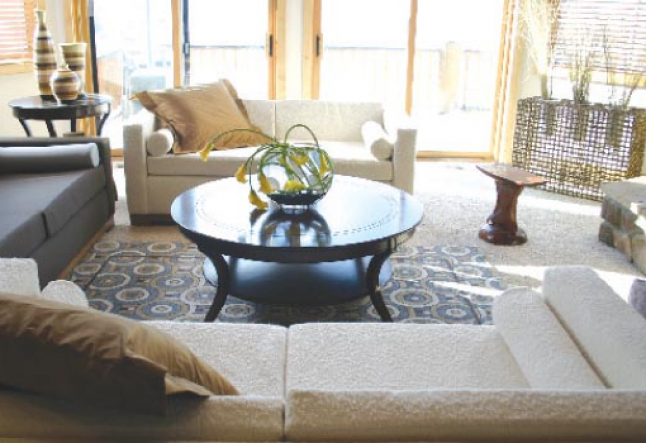 A few years back, Venice firm Organic Interior Design was asked to perform an eco-makeover on the Sundance Style Lounge – a process which required one five-ton rental truck, at least three all-nighters and several dozen doughnuts. The stress set in early – when we crashed the rental truck before we even got out of the parking lot in Los Angeles – and stayed with us on the drive to Park City as we cut through the desert, then the snow, and then even more snow. Once we arrived at our destination the pace doubled – we had only a day and a half to transform the entire house. People who were never expected to move furniture (like the publisher of our book and the DJ from the Viper Room) pitched in for the team. We felt like comrades in battle as we fought to bring in the furnishings before they blew away in the blizzard – our lips chapped, eyes heavy and bodies freezing. The hard work continued. But slowly, through a thick fog of exhaustion, it started to become apparent what was being accomplished. The new eco-design of the space felt like a breath of fresh air; so we indulged, breathed deeper and felt our heart rates go down as the eco-friendly art by Diana Jacobs, the final touch, went up. The space was ready just in time and there was an overall feeling that this Sundance production was not about flash or fame, but beauty and balance. The night the house opened, we overheard one guest marveling about how beautiful the garden was – it took us a moment before we realized that the “garden” she was referring to was actually the garage! It had been transformed so beautifully with furnishings made of natural, renewable resources that few realized the room’s original purpose. It quickly became a favorite place to relax with its sleek bamboo tables and coconut shell beaded hassocks by Palecek’s National Geographic Collection, and an eye-catching custom wall treatment by Woven Theory. In the days that followed, we continued to be amazed at the reactions people had in the lounge. Many individuals who had intended to stay for only 10 or 15 minutes ended up staying for an hour or longer to chat about eco-design, or to enjoy a relaxing organic hand treatment from Perfect Organics. Word traveled quickly, and as the week wore on people began to come by for a visit after hearing how incredible the eco-friendly furnishings really were in person. The living room was marked with mid-century inspired sofas which we designed ourselves, and which were built entirely of sustainable materials, including luxurious fabrics from Q-Collection and Indika. An oversized chess set from Southcone and a vegetable-dyed rug from the Natural Carpet Company anchored the room – and the views outside of the snow-covered hills didn’t hurt either. The room was also peppered with accessories from a consignment shop in Park City, called Right at Home, which primarily sells used furnishings. In the dining room we featured a reclaimed teak table, benches and framed mirror from Cisco Brothers – all of which were treated with linseed oil instead of a toxic finish. The result emphasizes the grain of the wood and is gorgeous! A den downstairs housed one of our own “First Step” sofas (eco-friendly outside, conventional inside) upholstered in an eco-silk/wool blend rust-colored fabric, by Q-Collection. We were delighted to discover that we weren’t the only ones who went green at Sundance. There was a myriad of eco-friendly and organic sponsors, organic food and even daily scheduled yoga practices – all scattered around at different events. It truly felt as though Sundance had been given an eco-conscious overhaul, one that will continue to have a presence at future festivals. The most exciting thing is this: because the Sundance Film Festival now represents what is new and exciting in genres beyond film, a strong green presence in Park City is a pretty good sign that we are heading toward a strong green future.